Honest-to-goodness Cottage with lots of porches, wood floors, and private pool. You already love Crystal Beach. Now you have found that quintessential Crystal Beach Cottage you have always been looking for! This charming home sleeps 6 people (4 in beds + 2 on a sofa sleeper) and is great for 1-2 discerning families with children, or 4 adults looking for a unique opportunity to rent a truly special Beach Cottage. This single story home is only rented to select groups looking for something a little extraordinary. This Crystal Beach cottage comes with a large front porch, an even larger screened-in back porch, a side porch, and two bedrooms, each with a comfortable KING bed. The master bedroom has a private en-suite bath with custom shower and walk-in closet, and the second bedroom has an adjacent full bath in the rear hallway, complete with a skylight. This is the home your small group will want to rent every year! This home has everything you could want in a beach cottage - and more - a brand new custom kitchen, an inviting living/dining area, an extra living area in the back with built-in desk, a large screened-in back porch, a neat little side porch with an outside shower, and a nice PRIVATE POOL in a beautiful backyard. There’s even a piano in the home! All this, and it’s barely a block from the beach and pristine white sands that Destin and Crystal Beach are famous for. We keep this home clean and well updated, and pay attention to amenities that you expect, such as high-speed wireless internet (FREE WIFI), a large 4K TV in the living room, big, fluffy bath towels and hair dryers in each bathroom, and more. We also provide items our smaller guests may need like a high chair and a pack-n-play. Everyone will feel right at home when you gather in the inviting open living and dining spaces of this amazing home with new real white oak floors. Plantation Shutters are a welcome upgrade that will make your stay even cozier. You'll love the upgraded sofa and oversized chair where you can sit back and watch the large, high resolution, 4K Smart TV. There is also a brand new dining table that seats 6. The new, custom kitchen is a chef’s dream with beautiful coastal cabinets and quartz countertops. The beautiful wood floors continue into this custom space which boasts new higher-end stainless steel appliances, a gas stove with convection oven, and most everything you’ll need to cook nice meals. The kitchen is equipped with plenty of dishes, pots and pans, serving dishes and utensils. There’s a Keurig K-Cup coffee maker, as well as a regular drip coffee maker. You’ll find a blender, toaster, and even a crock-pot in this well-equipped kitchen. We also supply many “extras” such as cleaning products, trash bags, aluminum foil, plastic wrap, sugar, creamer and spices. For your convenience, we have a front-loading washer and dryer in the home’s walk-in laundry room, iron, ironing board, and a second refrigerator. This master bedroom has a comfortable KING BED, night stands and lamps, plus 2 tall chests, and a big Smart TV. There’s a walk-in closet too with clothing racks, drawers, and shoe storage. You’ll find nice large windows with plantation shutters, and an en-suite custom bath with walk-in closet. An en-suite bathroom accessed from the King Master, this beautiful bathroom includes a large vanity, private toilet, and beautiful custom tile shower. A walk-in closet is attached to this bathroom, and you’ll also find big, fluffy bath towels and a personal hair dryer. This comfortable bedroom has another inviting KING BED, nightstand with lamp, plus a small chest and a Smart TV. It’s located near the back of the house, making it a welcoming private retreat. Hallway bath adjacent to bedroom #2 with a skylight, vanity, commode, and tub/shower combo. You’ll also find big, fluffy bath towels and a personal hair dryer. The beautiful private pool is surrounded by stone decking and nice landscaping, giving you plenty of space to enjoy the Destin sunshine. You can relax in the lounge chairs or at the dining table with chairs and umbrella for a little shade. For outdoor cooking, you’ll find a gas grill. And for your children’s safety, there are alarms on the doors leading to the pool from the main house. The Shirah Street public beach access point is just a short walk to the end of the block! We provide a beach cart with beach chairs and umbrella, so you can roll your gear to the beach with ease. This home is in the heart of Crystal Beach, a quiet, walkable neighborhood with white picket fences and easy access to shopping, restaurants and activities in Destin. Destin Commons, a beautiful upscale shopping and entertainment center, is less than a half-mile away. It features over 75 shops and restaurants, including Bass Pro Shop, World of Beer, Uncle Buck's Fish Bowl & Grill, AMC Theater with IMAX and much more. Local favorite, Camille’s, is an easy walk and The Crab Trap is about a mile east. You can bicycle, scooter, Jet ski and go parasailing all within walking distance. The Silver Sands Outlet mall is not far for those who enjoy “retail therapy”! There’s a driveway in front of the home which accommodates 3-4 cars (depending on size). There is no on-street parking in Destin. We are pet friendly and welcome your dogs in our home. Pre-approval and a $200 + tax pet fee apply (sorry not cats allowed). WE’RE CRYSTAL BEACH RESIDENTS TOO. You are renting from local owners who live in Crystal Beach, which ensures you get a better quality home. 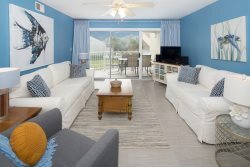 We know how difficult it is to find a vacation rental to suit your family’s needs, schedules and budget. We’re happy to assist you with the process of finding and booking the right place to stay for your vacation. We don’t leave you hanging—we do our best to get back to all email inquiries within an hour (and if you put your phone number into the inquiry form, we will call you)! Unlike many other people who never update their calendars, we always keep ours up-to-date.